Summer brings with it sunshine, warmth, and picnic season. 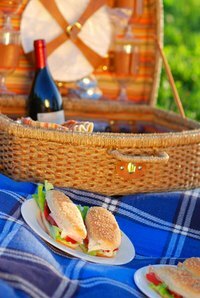 From backyard events to holiday parties, picnics can be a fun and inexpensive way to celebrate any occasion. To ensure everyone has a great experience during and after the picnic, it is important to consider food storage and safety. Food-borne bacteria can grow and cause illness if cold food isn't kept at a safe temperature while being served. Following some easy recommendations can help keep cold food at a proper temperature. Transport cold food properly. Keep food in a cooler filled with ice until you are ready to serve it. Cold food should remain at 40 degrees Fahrenheit or cooler. Ice packs can also help keep food at a safe temperature. Avoid opening the cooler as much as is possible. Once you are ready to serve your cold food and have removed it from the cooler, set it on ice. Dishes can be set in bowls or containers of ice. Replace melting ice frequently, making sure to drain whatever water has collected. Keep an eye on the time. Once food has been removed from the cooler and served, it should be out for a maximum of two hours. On days when the temperature reaches 90 degrees Fahrenheit or higher, the food should be removed after one hour. Food that is out for longer than these time periods should be discarded.